Even the most casual baseball fan knows of Shoeless Joe Jackson and the 1919 Black Sox scandal. The White Sox slugger’s banishment has been turned into the ultimate baseball tragedy, alternately being perceived as a hapless fall guy for the big business baseball owners or a greedy ballplayer whose crookedness rocked the foundation of the National Pastime. While Shoeless Joe’s career with the Indians and White Sox have been well described, what Jackson did after he was expelled from the game remains a bit less well known. In the decade following his 1920 expulsion, Jackson lived the life of a baseball mercenary, playing games here and there as a ringer for hire, often under assumed names. As he continued his baseball career under cover, Jackson of course needed to update the tools of his trade, namely his bats. For that most important implement, Jackson turned to Hillerich & Bradsby, the Kentucky company that had supplied his treasured Black Betsy models when he was a big leaguer. This is one such post-Black Sox scandal Joe Jackson model bat. As found on other examples of Joe Jackson post-ban Hillerich & Bradsby bats, this bat has “JACKSON” stamped into the barrel. The omission of Jackson’s signature stamp or even his first name may have been due to Shoeless Joe’s banishment from pro baseball. 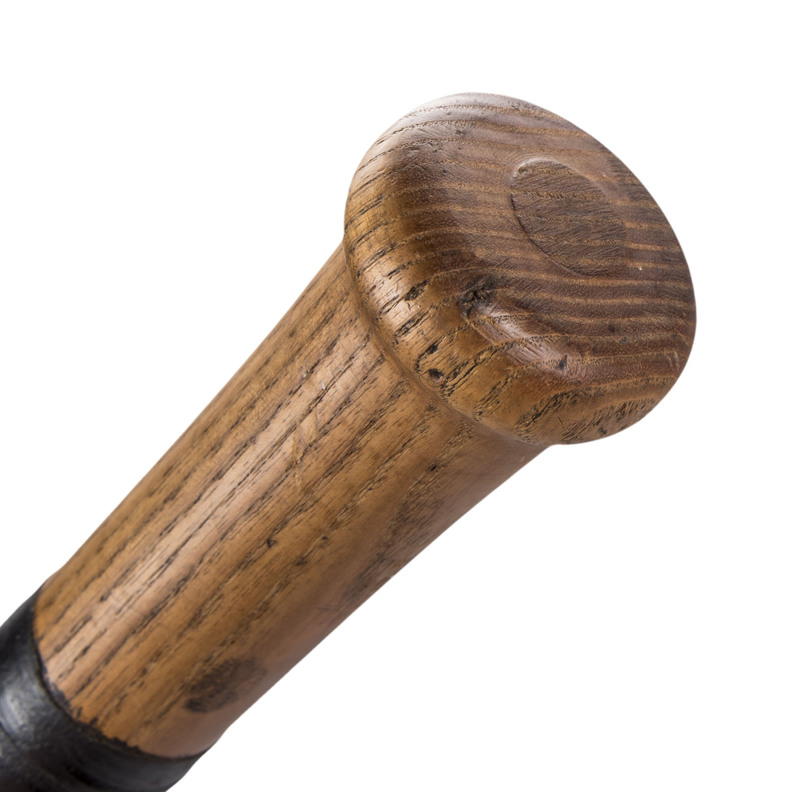 The Hillerich & Bradsby J13 model bat can be dated to the 1923-1925 period by the C-4D style center brand present on the bat. 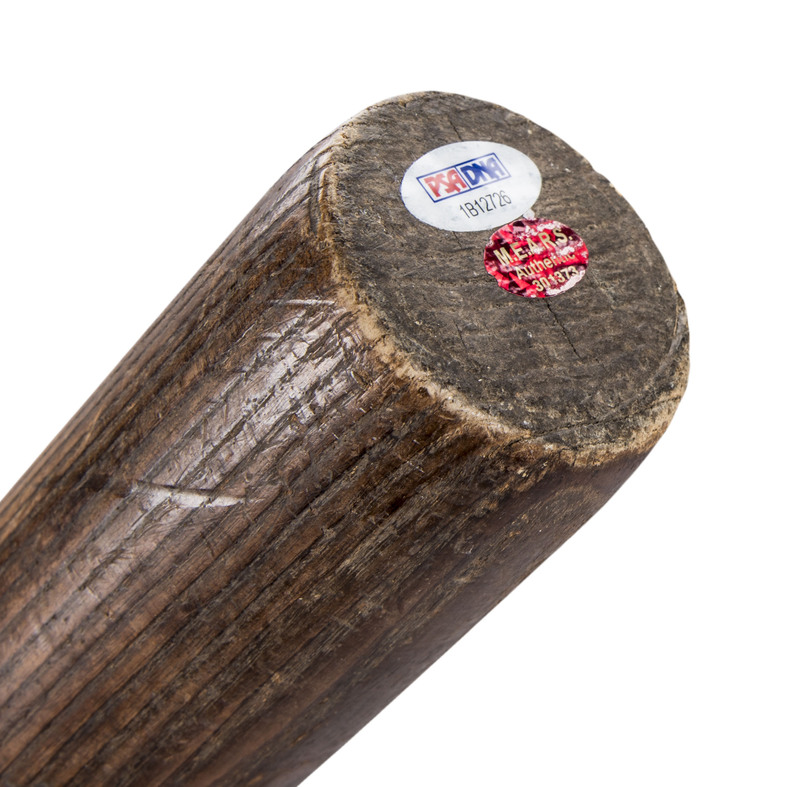 The bat measures 35 inches and weights in at 37 ounces and is identified as Joe Jackson’s J13 model by the thick handle, small knob and the bullet-shaped top barrel (which has been trimmed on this bat). Lastly, the bat has been treated with the dark Black Betsy finish, giving it Jackson’s trademark appearance. The barrel shows significant wear with many ball marks with stitch impressions and surface dents visible and is un-cracked. The handle has a ring of black tape to enhance the grip and there is some grain swelling present from repeated ball contact. The left barrel has been scored from the center brand to the top barrel that was believed to add an underspin to a hit ball. An incredible bat dating to Shoeless Joe’s years spent as a baseball player for hire on America’s sandlots and semi-pro fields. 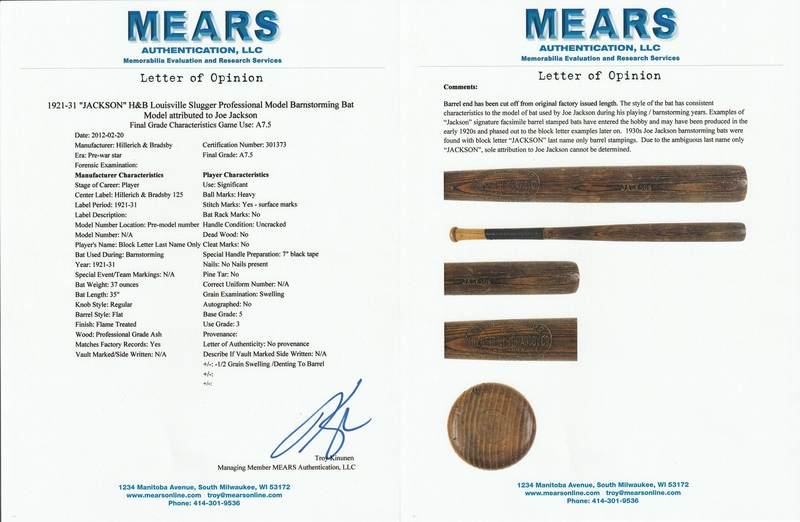 The bat comes with an LOA from MEARS (301373), who have graded this bat an A7.5 and a LOA from PSA/DNA (1B12726) for the game use.